There are plenty of opportunities on campus for students to engage in recreational activities. In addition to its vast array of sporting opportunities, the University of Chicago also provides students with the chance to engage in other recreational activities and exercise. There are two gymnasiums at the University: Gerald Ratner Athletics Center and Henry Crown Field House. Besides being a fully functional gym, Ratner is stocked with a swimming pool and indoor courts. This is where the swimming and basketball varsity teams play their home games. Popular recreational activities like yoga, zumba, pilates, and kickboxing take place in Ratner, where people of all skill levels are welcomed and encouraged to take part. Ratner offers weekly sessions for all these events. Crown is primarily used as the home base of the indoor track and field teams, but indoor sports like squash and table tennis also play here. Crown also houses some gym equipment. Most outdoor events happen at Stagg Field, where the football and soccer varsity teams play. However, there are other fields available, such as the Midway, where midnight soccer takes place, and the Campus South Athletic Field, for sports like cricket and lacrosse. Zumba classes happen here Mondays, Wednesdays, and Fridays as opposed to at Ratner. The schedule for fall quarter can be viewed on the recreation section of the UChicago Athletics website. Probably the most famous recreational activity and tradition is Kuvia, which takes place during winter quarter. During this weeklong event, daring students wake up early in the morning and walk in the cold to Crown, where they perform sun salutations and engage in various RSO-led workshops. 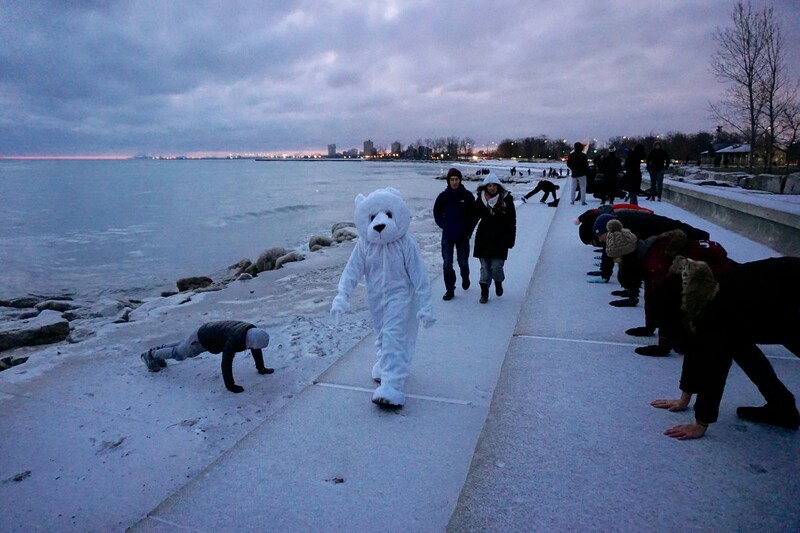 On the last day, everyone walks up to Promontory Point to do sun salutations and receive a long-sleeved tee commemorating the accomplishment.